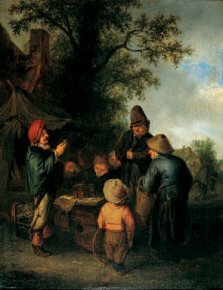 20/9/08— Thefts — Haarlem, Frans Hals Museum — The Dutch police have recovered five paintings which had been stolen in 2002 from the Frans Hals Museum in Haarlem. 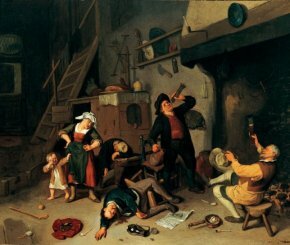 These include a Cornelis Dusart, The Drinkers (ill. 1), a Cornelis Bega, The Musicians, two by Adrian van Ostade : The Happy Drinker and The Charlatan (ill. 2), the latter belonging to the Dutch institute for Cultural Heritage (Instituut Collectie Nederland) and a Jan Steen, Charlatan at the Market, belonging to a private collection. Three of the works were slightly damaged. They will nonetheless be exhibited at the museum until 28 September.